This is a really great keyboard and mouse set. IN fact, you'll struggle to find one better, anywhere. Microsoft cops probably more criticism than any other company in the world. People just seem to like moaning about Windows and Office, and let’s face it, it’s easy to see why somtimes. But one thing Microsoft cannot be criticised for is making rubbish peripherals. Because it makes good ones. Microsoft makes some of the best keyboards and mice on the market, in fact, and the Wireless Laser Desktop 7000 demonstrates this perfectly. Some people might think that a keyboard is just a keyboard, and that there isn’t much difference between all the different types. But those people couldn’t be more wrong. Because for folks who use computers all day (that’s most of us, then) a comfortable keyboard can make things so much more comfortable. The Wireless Laser Desktop 7000 comes with Microsoft's Laser Keyboard 7000 and the Laser Mouse 7000. 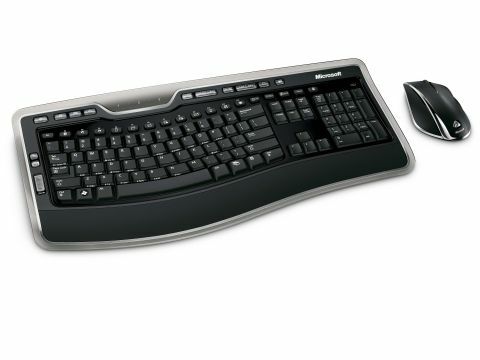 Both are ergonomically styled to make typing, pointing and clicking easy and comfortable. There’s just something about this keyboard which makes it a pleasure to type on. The keys make minimal noise when you’re tapping away at them, and they offer the perfect amount of resistance as to make typing a very smooth, creamy experience. The styling is a bit unnecessary – built for use with Windows Vista, it’s got a transparent edge to emulate Aero graphics. It looks ok, but more useful are all of the Windows-specific shortcut keys. There are a lot of them, offering quick and easy ways to open music, email, spell check, zooming, saving etc. The mouse too is also very nice. It’s ergonomic in the way that it provides little ridges for individual fingers to rest on. Absolutely ideal for right-handed mouse users. Lefties on the other hand, will find it utterly impossible to use. The mouse is rechargeable, and comes with a charging dock and a rechargeable battery. All round a really nice desktop set, then. The price (around £70 or so online) might put some off, but really, if you find yourself typing away at your PC for long hours, this is a worthwhile investment.